When Mary and Sam (and various other siblings) were young, they played a game on the Mac called Crunch. Dad, not wanting children to go messing around in the applications folder, had created an alias (the mac equivalent of the windows shortcut) on the desktop. Because of this, the children all grew up believing that the game was actually called Crunch Alias. It was not until much later that the truth became known and, because of this, the "Crunch Alias" incident has become something of a standing joke within the family. 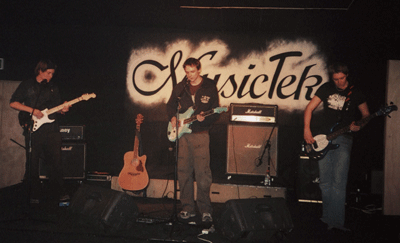 It was late 2003, during the start of Pawel Osmolski's first Music Tech Specialist BA (Hons) University year. Pawel met fellow guitarist Sam Morgan during the enrolling period and both got along really well. It was only a matter of a few weeks before they started working together, although the direction was blurry at the start; Pawel was writing a lot of solo material, but it wasn't until Sam helped with a song called Plaster that things really started to take shape. Pawel and Sam were both unemployed, swamped with university assignments and running on a low budget, but they needed a place to rehearse. Luckily, Pawel had a lot of space at his Parent's house in a spare room, so with his student loan he bought a digital mixer, a couple of microphones, hooking up his amp, Sam had his semi-acoustic and started to jam along to the songs Pawel had written. It was a very laid back approach at the beginning, as they kept on rehearsing every week or so until there was a comfortable amount of songs with enough variety. A year later in 2004 and the songs were taken to a different level, since it was only the two of them, there was no bassist or drummer yet which was a frustrating issue. They started recording songs onto a digital mixer and then transferred the recordings to a computer. Afterwards, drums, bass and keyboards were all recorded seperately by Pawel, a recognizable sound was slowly being established. University helped a lot in the second year because they ended up recording material over there too. The band didn't even have a name at this point, so Pawel decided to temporarily call the band deVilhoOD, named after his online alias (ed. admittedly not the best choice for a band that was primarily indie and experimental). Ads were put out for a bassist and drummer, but Pawel and Sam didn't want the wait to become depressing, so they formed a set-list, the basis for an EP and things were finally set in motion. Dave Middleditch joined the band in April 2005 to manage and play bass with them, he began booking gigs as soon as he was comfortable with the songs. Things seemed to be going really well; the band had their first gig together at The Bull pub in Romford and it went smoother than they expected. Lot's of close friends came down for the night so it was a great way to start off on the long road. Chrisy Finn joined on drums mid-August 2005, a week before they were entered into the East London Battle Of The Bands contest. Having played quite a few gigs in an attempt to build a local-following, confidence was slowly growing, but Dave, unfortunately, had to take his leave of the band due to work commitments. This was a big loss for them and resulted in a hiatus period that lasted a year during the latter part of Pawel and Sam's studies up until the summer of 2006. After their course finished, Sam decided to look for some full-time employment and move closer to work in-order to cope with living costs. Life was changing for both of them that year, with Pawel continuing to write songs, he had also been rehearsing with Sam's sister Mary, who was to later become their replacement bassist in the band. Pawel wanted to study even further and started his Audio Tech Masters Degree at the end of the year. The band took on a new path in 2007, resulting in a change of band name, from deVilhoOD to the more ambiguous CrunchAlias. Things were slowly starting to get back on track. Their brand new web-site, a new image and a fresh lot of new songs were what they desperately needed. Rehearsals were becoming more regular with Mary now learning their portfolio of material, soon they will be booking some gig dates to set off on the path again.